Aeolus | Learn about Greek Mythology,Greek gods,Greek mythology stories! Aeolus, in Greek mythology, was appointed by Zeus as the keeper of the winds. 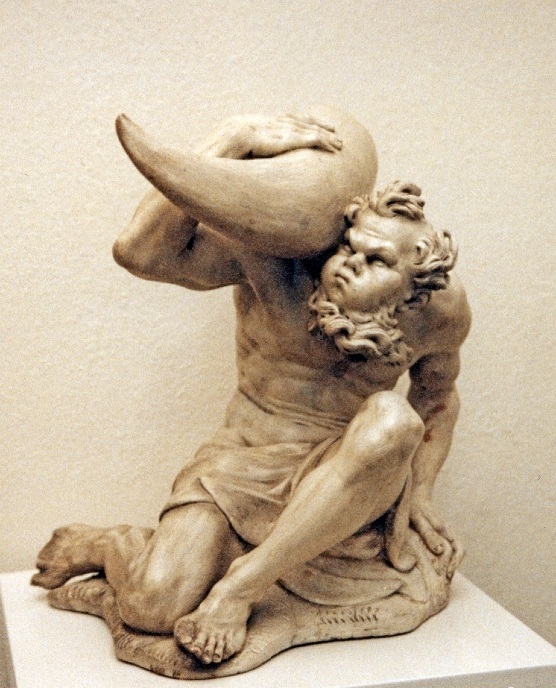 Aeolus kept the winds in the bag and left them when Zeus commanded him. He was the son of Ippotis(knight), as Homer says. So he was called Ippotadis. He lived on the island of Aeolia, which had bronze walls. This island was thought to be the Stroggili(round), the current Stromboli, hence the name Aeolian Islands for complex owned Stromboli. He lived on the island with his wife Amphithea. They had six sons and six daughters, who personified the winds. His sons represented the strong winds,and his daughters the mild (auras). According to a later version of the myth, Aeolus was the son of Poseidon and Arne.He lived with his mother and his brother Viotios, in Metapontio. When forced to leave Metapontion because of the murder of his adoptive mother Autolycus, fled to an island in the Tyrrhenian Sea, where he built the town of Bara,according to Diodorus Siculus. He invented sails so ships could move and taught their use to the nationals. Odysseus and his companions went to Aeolia, where Aeolus hosted them one month. When they asked for help from Aeolus to depart, he closed all the winds in a sack and left only Zephyrus blowing favorably for them. With the help of Zephyr Odysseus and his companions came close to Ithaca. But sometime that Odysseus fell asleep, his companions opened the sack, thinking that it has gold inside, and letting all winds free.Α violent storm broke out and sent Odysseus back to the island of Aeolus, who did not consent to help him again, punishing him for impiety of his companions.The Greeks believed Aeolus was the treasurer of the winds,and not the god of the winds. So he was not sacred, nor were sacrifices in his honor.But the Romans had him as a god. Virgil in the 'Aeneid' refers to him as king residing in a lair where he had inprisoned the winds,Hera turns to him though when she decides to destroy the ships of the Trojans. One of the daughters of Aeolus was Alcyone,which is associated with the legend of the Alkion days. Alcyone fell in love with Keykas(Ceyx) and they lived happily, but one day while Keykas(Ceyx) was fishin,he fell and he drowned and Alcyone not being able to bear the pain she fell off the rocks and got killed. The gods took pity on them and make them birds. Zeus even commanded Aeolus annually in January to stop the winds so Alcyon will be able to incubate her eggs.